This salad is about as easy as it gets. I buy my spring mix by the box to get a substantial discount from my grocer. The mix is pre washed so I just throw it into a bowl, a very large bowl in this case. 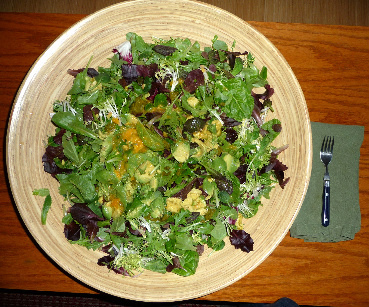 I dress this salad in a minute or two with avocado and the juice/pulp from one orange. The other ingredients really make it for me in terms of flavor and provide bountiful nutrition. I sprinkle the ginger on top of the lettuce. Tear the nori into small pieces, or you can cut it with scissors, and add it. Then spoon out small bits of avo onto the top. Cut the orange in half and use a spoon to ream and scrape the pulp and juice from both halves. Toss and dig in.